For the second week in a row, No. 1 Everett is playing in our top game to watch when they host No. 6 St. John's Prep. A Patriot League Keenan battle, two big non-league contests, and a Hockomock Kelley-Rex showdown highlight our other four games to keep an eye on. For the second straight week, Everett will be featured in our top game of the week and for the third consecutive week, the Crimson Tide will go up against a top 10 team in our poll. Of course, no season would be complete without Everett homecoming and that's what this game signifies as No. 6 St. John's Prep comes to town. Mike Sainristil has his fingerprints all over the Crimson Tide's early season success as illustrated by his incredible week two performance where he scored twice and corralled three interceptions. St. John's Prep is out to prove that anyone already placing Everett in the Div. 1 Super Bowl is getting way ahead of themselves. The Eagles have shown a high-powered offense of their own in the early going scoring a combined 72 points over the first two weeks. Quarterback Matt Crowley stewards the attack with Aise Pream, Anthony Fagan, and Wes Rockett highlighting a multitude of weapons to choose from. Entering Saturday afternoon, St. John's Prep is just 2-16-2 all-time versus Everett, but this gives the Eagles a chance to not only notch a victory versus the top-team in the state but to prove that things are much different from a season ago. There is plenty to be intrigued about when these two face off on Friday night. Not only are both Whitman-Hanson and Hingham out to cement themselves as the top contenders to Duxbury in the Patriot League Keenan, but also to take home the Div. 3 Super Bowl trophy. In week two the Panthers survived, squeaking out a 9-6 win over New Bedford thanks to a Jake O'Brien 34-yard field goal. Whitman-Hanson was without senior quarterback Ethan Phelps but he is expected to return this week. Phelps gives the Panthers a whole new dimension on offense, opening up the attack not only through the air but helping to create lanes for C.J. Guiliani and Mike Conners on the ground. Hingham has had two weeks to prepare for this matchup as after knocking off Foxboro to open the season the Harbormen had a bye in week two. Spencer Cassell is known for his talents on offense but made his presence felt on the defensive side of the ball against the Warriors using his athleticism and size to make tackles in the open field. Defensive tackles Nick Capodilupo and Owen Reilly are also two to watch. Hingham's size up front allows them to control time of possession while they lean on backs Charlie Egan and Grady Harrington out of the backfield. 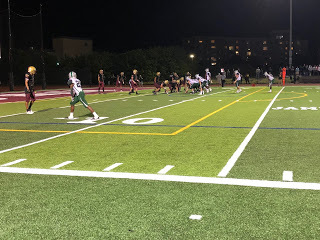 The Habormen have overcome deficits in each of the last two seasons to knock off Whitman-Hanson, scoring 32 unanswered points to beat the Panthers 32-12 in 2016, and putting up 22 second half points last year to come away with a 28-21 victory. This game presents a unique opportunity for both teams. Tewksbury comes in at 2-0, fresh off a nail-biting victory over Methuen in which Tyler Keough drilled a game-winning 33 yard field goal. BC High, meanwhile, picked up its first win of the season last week in a 24-0 rout of Marshfield. While Tewksbury is hoping to make a statement to the rest of Div. 3 that it can play with the 'big boys' in Massachusetts, BC High is hoping to create some momentum heading into a brutal four game stretch against Brockton, Everett, St. John's Prep and Xaverian. Quarterback Jay Connolly is the heart of the Redmen offense with Shane Aylward as his favorite weapon on the outside. Aylward was on the receiving end of all three of Connolly's touchdowns in week two. Jack Kelley and Kyle Zervas balance the attack out of the backfield. So far the Eagles have largely relied upon a steady diet of ground and pound to generate momentum on offense. The running back duo of Brendan Cassamajor and Buddy Penella do the heavy work while Carter Rice provides an extra gear of speed. Keith Henderson, Kaleb Moody Ozzie Tripilo, and John DeStefanis steward the defense. If North Andover is hoping to knock off Lincoln-Sudbury is a potential Div. 2 North Final, one of the keys will be securing home field advantage throughout the playoffs. A win over a Div. 1 opponent in Central Catholic would go a long way towards securing just that. The Scarlet Knights welcome the Raiders to town after a second consecutive blowout victory to begin the year. Quarterback Jake McElroy has come as advertised in the early going with Gabe DeSouza and Darren Watson giving the Scarlet Knights' offense a multitude of options to choose from. Defensively, North Andover has held the opposition to a combined 21 points through the first two weeks. Central Catholic hung with St. John's Prep for three quarters only to see the Eagles slip away late for a 29-12 loss. The young Raiders will now look to add a quality road win to its resume. Joe Howshan is the player to watch as he has done it on both sides of the ball with Anthony Caggianelli also carrying big-play capability. In the preseason, this matchup outside of the two respective towns may not have caught much attention. All of a sudden, however, this looks like one of the top games on the slate in the early going. Franklin has surprised many by beginning the year 2-0 including a key non-league win over Andover. The Panthers have a bevy of talented players at the skill position highlighted by wideouts Ryan Driscoll and Jack Nally. First-year starting quarterback Nick Gordon has done it with both his legs as well as his arm. The Hornets are hoping their two brutal non-league matchups versus BC High and Everett pays dividends here. Nick Marciano has shown flashes of being one of the top offensive threats in the section with quarterback Damani Scott possessing the ability to make plays outside the pocket. Considering how both teams like to play on offense, this very well could turn into a shootout with large Hockomock League and postseason implications in play. If Franklin can come out on top, look for many in Div. 1 South to begin taking them as legitimate contenders while Mansfield can take a huge stride towards earning a top four seed in its own section with a victory.